An industry expert, Lena brings over a decade of expertise in Training/eLearning/Blended learning and performance support solutions, knowledge management, workflow improvement and change management. Her current focus is on psychological typologies Charat Method and on Education (blended). Lena has over 15 years of experience in education. Her main focus was on the new program development, planning and implementation of blended learning, curricula development utilizing both online and on-site learning. She is an expert in professional education and corporate training, and was a CEO of GLS, a New York company leading in educational program development using eLearning methods. Parallel to her work in education, she is an author of Charat. In business Charat Method is used for effective communication among employeеs, development of education content and in working with clients. 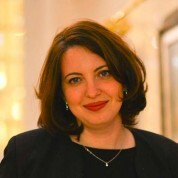 She has founded a private psychometrics practice in Moscow and London and became a partner at a Meaning Formation Laboratory (a methodological company with focus on various educational practices). Lena graduated from Fordham University (NY, USA) with a degree in Psychology and a London School of Life Couching. She is also certified by CPP to administer and interpret over 15 psychological/psychometric tests. She received her MBA from Carey School of Business, Johns Hopkins University (USA). As Shimon Perez said - Youth is when your dreams exceed your accomplishments. Teachers make us grow and dream big! Global Teacher Prize is an excellent way to celebrate true stars that inspire our future!